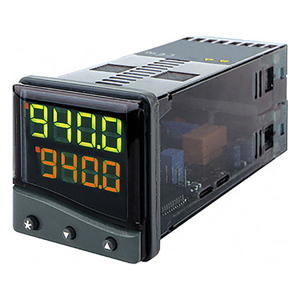 The new 1/32 DIN CN9500, 1/16 DIN CN9300 Single Display and 1/16 DIN CN9400 Dual Display controllers follow the OMEGA tradition of innovative design. Building on the success of the CN132 and CN9000A series, the new models include several new features, the most important being the option of a low cost serial communicating system with easy to use Windows-based software. The CN9-SW series software bridges the gap between the "stand alone" system and full SCADA of Fieldbus control networks by providing a facility for remote supervision of up to 32 instruments using MODBUS protocol. It requires only a modest investment and can be operated by anyone with a medium specification PC or laptop that can be run with Windows 95, 98, NT, or XP. 1/16 DIN Dual Display. Relay on Output 1. dc Pulse on Output 2. 1/16 DIN Dual Display. dc Pulse on Output 1. dc Pulse on Output 2. RS-232 Communications Board. Field Installable. RS-485 Communications Board. Field Installable. Trim Plate adapter, 1/16 to 1/4 DIN panel cutout. Field Installable. Trim Plate adapter, 1/16 to 1/8 DIN panel cutout. Field Installable. Noise Suppression RC snubber (2 leads), 110 to 230 Vac. Field Installable. Software for either RS-232 or RS-485 communications (refer to CN9-SW specifications. Compatible with Windows 95 and Windows NT. 참고: Note: one communications option can be ordered per unit. Field installable communications boards can be installed in the field. *Low voltage power option is not field installable and available only on the following models: CN9312, CN9322, CN9512 and CN9522.